Need more information about booking Home 7305758 ? 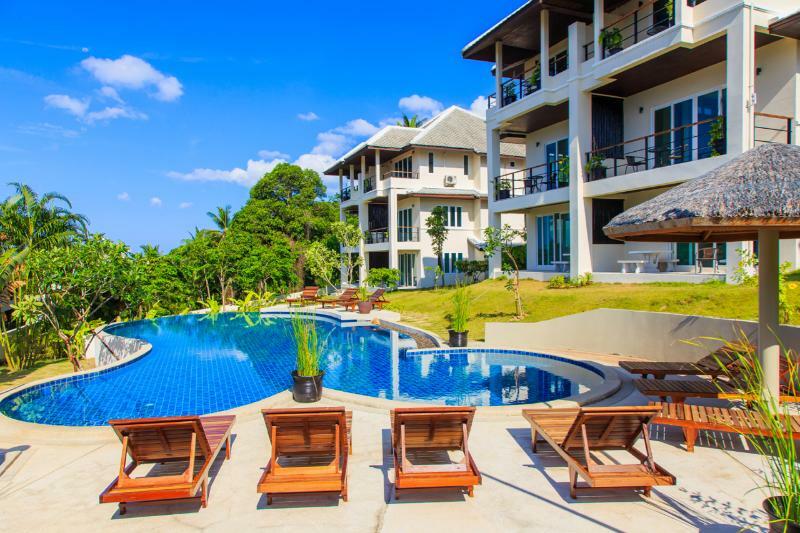 Tucked away on Bophut Hills and sun-blessed throughout the whole day, Villas Tropica is a group of 6 villas built around a luxurious garden and a large swimming pool, hosted by a full service on-site team. The "3 bedrooms villa" is beautifully decorated. The villa has a spacious living room with a comfortable sofa area, a flat screen tv and a dvd player (DVD selection available). Comfortable Bedroom with modern bathroom. Each bedroom offers one cozy queen bed, bright windows and a private bathroom with amenities. Extra beds are available on request for a charge, with one extra bed only per bedroom. On each floor of the villa, there is a balcony with a table and chairs. The villa is equipped with a kitchen area, furniture, equipments (kettle, toaster, cooking station, mini fridge). The villa has a garden and swimming-pool view at the ground floor, a sea view from upper floors, and an equally easy access to the central swimming pool. The blue swimming pool is surrounded with flower trees and sun beds. Length is 15m, declining depth is from 1m to 1.80m. Located in the centre of the resort, the swimming pool area gathers kids and adults around a place of fun and entertainment. Our service team provides towels, drinks, cocktails and snacks around the swimming pool. An Ipod dock and an outdoor shower are available by the swimming pool. Our pleasant tropical garden around the swimming pool offers a joyful space to relax, sit on the greenest grass, enjoy a picnic or a natural playground for kids. On site team service is available at anytime, 24/7. If you’ve already booked, go to Manage your holiday booking to view Thomas the owner's contact details or send them a message. Or send Thomas (the owner) an enquiry through the Contact the owner/manager form if you’d like a quote or more info first. When you pay online through the Book your stay form, a booking request is sent to Thomas (the owner). You’ll find out within 24 hours whether they’ve accepted - no money will leave your account before then. You can also request a quote from Thomas (the owner) through the contact form. The owner will email you the total cost for your dates and a link to book and pay online. Use the Book your stay form to pay provisionally online. You can pay by credit/debit card or PayPal. Thomas (the owner) will have 24 hours to accept the booking and no money will leave your account before then. Why can't I call Thomas (the owner) before booking? You’ll need to contact Thomas (the owner) to do this. Send them a message in Manage your holiday booking or through the contact form on this page. You can request to change the dates or number of people on your booking via the Manage your holiday booking page. To change your holiday dates use the Edit booking button. If you need to change the number of guests staying then send Thomas (the owner) a message. If Thomas (the owner) agrees, they’ll send you a revised quote outlining the changes. You can review and accept/decline this from the Manage your holiday booking page. You’ll have 48 hours to take action before the revised quote expires.